With a project article for Popular Woodworking Magazine wrapped up, I got back to work on the large – some would say humungous – walnut secretary. This week I spent more than a few hours working on a frieze moulding to sit just below the crown. I say formidable fretwork frieze not because the moulding causes fear or apprehension, or due to its awesome strength. To me, frieze arouses feelings of grandeur. It is a nice addition to a piece of furniture, but it’s not a moulding you should include if you’re short on time. 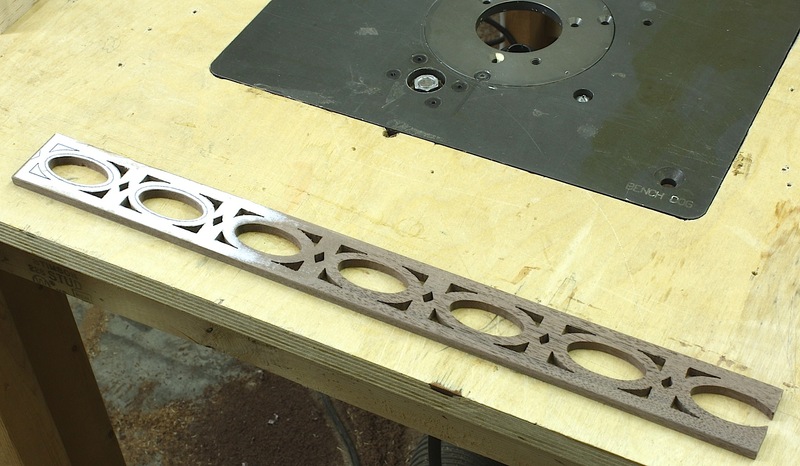 To make this moulding, I use a scroll saw which is not part of my machine inventory. I borrowed this Craftsman saw from a friend and would highly recommend it if you’re in the market. To make my frieze, I developed a pattern from my SketchUp model. (To read how to do this from an earlier post, click here.) After my pattern is spray-glued to thin walnut stock, the work begins. 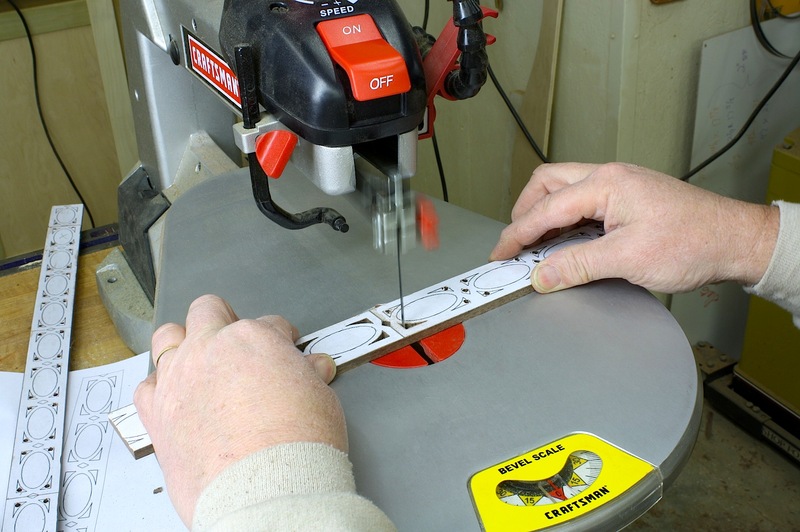 As shown in the photo above, step one is to drill a small hole through each and every one of the areas that are to be cut away. 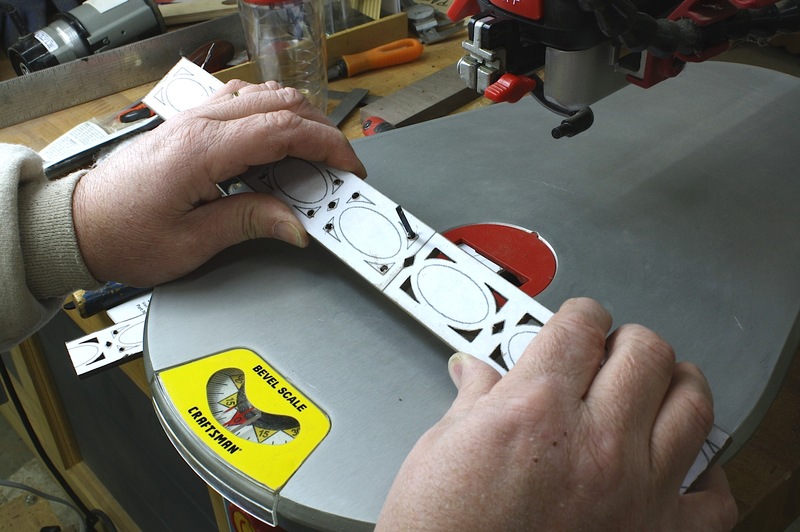 Your hole has to be large enough to fit a scroll saw blade through, but still smaller than the waste area – this almost didn’t happen for me and I thought I was going to have to go back and rework my pattern. With every hole, you have to thread your blade through the hole, reattach the blade to upper arm, tighten the blade holder screw then re-establish blade tension before you cut. Each repeating pattern has four waste areas around the oval, then between each oval there is a small diamond. You can see why I say don’t use this moulding if you are short on time. Note the small bridge used to elevate the moulding above the tabletop and provide clearance for my router bit. 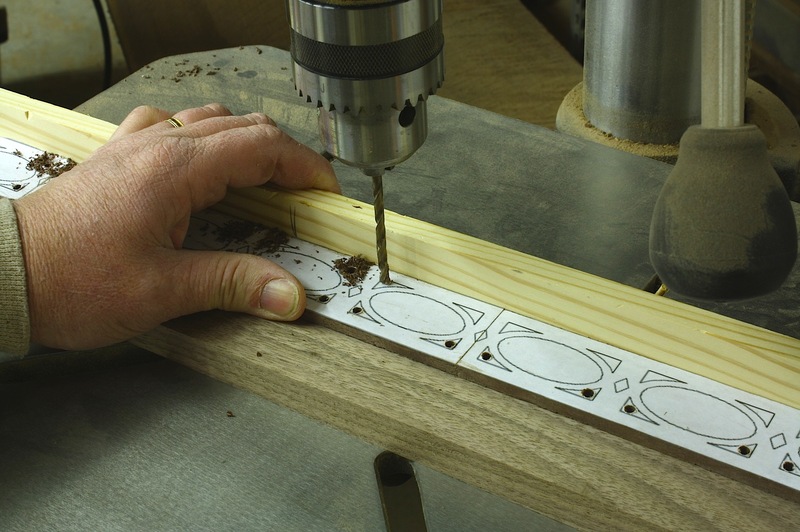 Instead of making a new pattern that would be difficult to position – the pattern oval was exactly the size of my original pattern – I turned to router accessories to do the job. Take a look at the photo immediately above and you can see a bushing with my router bit peeking through. My bushing rides the edges of the pattern while the router bit sits inside the lines. Bingo, my ovals were beefed up, and routing out oval waste was much less time consuming than doing this work at the scroll saw. The moulding shown here is from paper pattern to sanded smooth. When I get things wrapped up on the secretary, I’ll drop in a close-up photo of the finished frieze. Very attractive. Time consuming, but attractive. Thanks for the pictures. 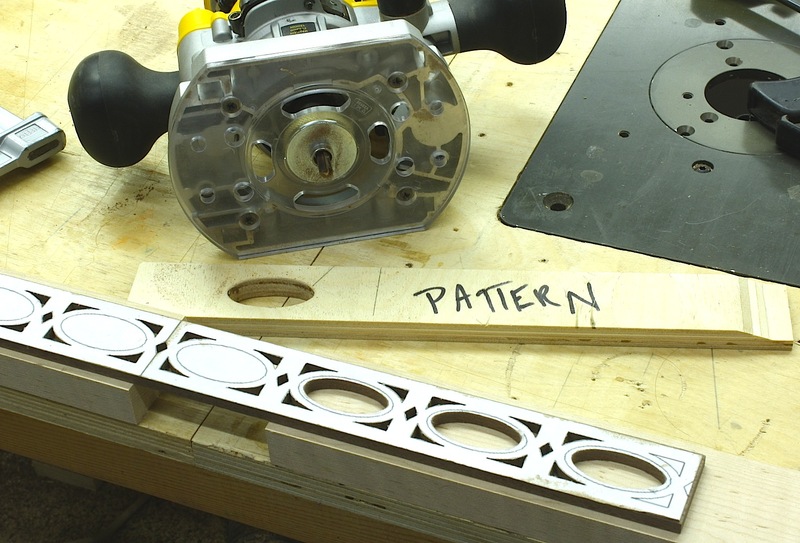 That router can sure save time when using a Pattern! The only way to fly! Are you going to post all of your progress while making the Secretary? It looks “fablously elaborate!” The new secretary must be an impressive unit. In comparison to the 18th Cent. Secretary in your book “Building Period Furniture,” just how much more “humongous” in this new secretary? And what is the period style? I am gearing up to build the unit in the above mentioned book. The new 528 sq ft addition to my shop is about half finished. Can’t wait to get into it and get all my “hand work” tools out of the current section into the new. The walnut piece is 52″ wide and stands 103″ tall. As for style, it is based on late Queen Anne or Chippendale designs mixed with a few attributes found on Southern furniture – this piece will reside just outside Charleston, SC. Thanks for the information regarding your “humongus” Secretary work in progress. I thought it might be more desireable than the unit “New England Desk and Bookcase” style secretary in you “Building Period Furniture” book. Even though the ceiling in our living room is 12′ high, I still believe we will be more happy with the “New England” unit. Our 50th wedding anniversary will be in August 2013, so I’m targeting the completion as a gift to my wife for the anniversary celebration. I’m sorry to be so long in responding. My contractor and I are almost finished with a 528 sq. ft. addition to my current shop. Needless to say I’m truly a “Happy Woodworker” for the dream shop of 20+ years in the saving and planning. The new addition will be used for all hand tool work, a foldable wall spray finishing corner and will include some bench top tools (hollow chisel mortiser, etc.). Last August I completed a solid ash (8/4 laminated top) 18th Cent. style Roubo, split top workbench with Glide Leg Vise and Veritas Quick Release tail vise, both built in Brazilian Jatoba, which will be the main focus space of the new addition, along with my custom built hand tool cabinet with dovetail saws, hand planes, chisels, carving tools, etc. Thanks for letting me “bend your ear (?eyes? ).” I’m enjoying receiving your blog. … sounds like it’s going into one of those Southern Plantation mansions as in Gone With the Wind! It would NOT fit in our house… anywhere! … barely into the garage! That is an AWESOME piece to build! It will be a pleasure to see how you do it.